There are five stories in Carroll’s collection and each one of the stories feels vaguely old-fashioned. The monsters that live on these pages have been around for a very long time. In the first story “Our Neighbor’s House,” Mary is left in charge of her two younger sisters, Beth and Hannah, while her father goes off to hunt. Their father tells them “I’ll be gone for three days…but if I’m not back by sunset on the third day, pack some food, dress up warm, and travel to our neighbor’s house.” When their father fails to return, things go from bad to worse in short order. In the final story, “The Nesting Place, ” Bell, short for Mabel, spends her school holidays with her older brother, Clarence, and his wife, Rebecca, at their isolated country house. Bell is a solitary child and she takes little interest in socializing with her brother. The only other person at the house is the housekeeper who warns Bell not to venture into the woods because she could easily become lost as Rebecca once had, “found three days later at the bottom of a cave…three days all alone in the dark drinking water out of a fetid pool to stay alive.” Rebecca, as Bell is soon to find out, has been deeply changed by that experience. And not in a good way. The stories between the first and last are every bit as unsettling. Dreams and teeth and blood and beasts loom large in this collection.Carroll’s illustrations are saturated with primary colours: blood-red moons and sapphire blue rivers. 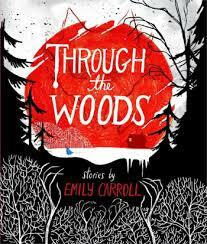 I don’t know much about art, but Through the Woods is a beautiful book to look at – if slightly macabre. See more of Carroll’s work at her website. 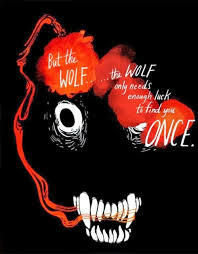 This entry was posted in Book Chat and tagged 2014, Book Review, Canadian, graphic novel, highly recommended, horror by Christie. Bookmark the permalink.